The cover star to have a go at the Madden curse for the 2011-2012 season has been revealed. Being on the cover of Madden NFL should be a great honor, but it's not. On one hand, your name and helmeted face becomes known by millions of people around the world. On the other hand, you take a chance at becoming the recipient of the Madden curse, which has knocked football athletes off their game going all the way back to 2001. 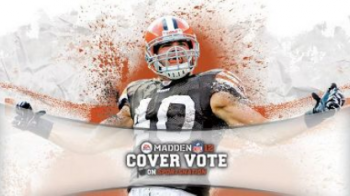 The next cover star to potentially be affected by the curse for Madden NFL 12 has now been determined by a fan vote. The vote to determine this man was held over on ESPN's website. Peyton Hillis, runningback for the Cleveland Browns, and Michael Vick, quarterback for the Philadelphia Eagles, went head-to-head in the vote's final bracket. After over 1,000,000 votes, Hillis came out ahead with 66% of the vote. Hillis fans mounted a surprisingly successful campaign to put him on the cover, causing him to upset various other NFL stars on his way up. Cleveland must never have heard of the Madden curse. Additional votes may have gone to Hillis due to Vick's shady past, with Vick having been convicted of a felony for taking part in an illegal dog-fighting ring. He returned to the NFL after 21 months in prison as the Eagles' back-up quarterback, but a strong performance put him in the team's #1 spot. Again, animal rights fans must never have heard of the Madden curse. Vick is probably happy about the outcome, because he appeared on the cover of Madden NFL 2004 and broke his leg that year. On a positive note, the Madden curse hasn't struck every year for the past decade, only for about 80-90% of them, so if Hillis is lucky he might get a bye.